Hope Academy needs to build new classrooms for the children. If you can help with this project, please make contact through the Donations page. 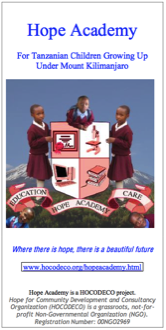 The Hope English Medium Academy (HEMA or Hope Academy) located near Arusha, was established to care for and educate Tanzania’s most vulnerable children. HEMA (in Kiswahili) means to breathe deeply. Once a child joins the school they start to breathe as the school gives them the hope of living. The school also prepares children to be strong, spiritually, financially, socially, intellectually and psychologically. There are currently more than 50 children enrolled in the school. Many of these children are orphans whose parents have died from HIV/AIDS. Others come from very low-income families who are unable to support themselves. Without Hope Academy, most of the children would not have food, clothing or education. In the past 3 years, we have helped 15 of our children to enroll in higher level school. 60 families in the community have directly benefitted from our efforts.